View More In Solar Chargers - Page 2. 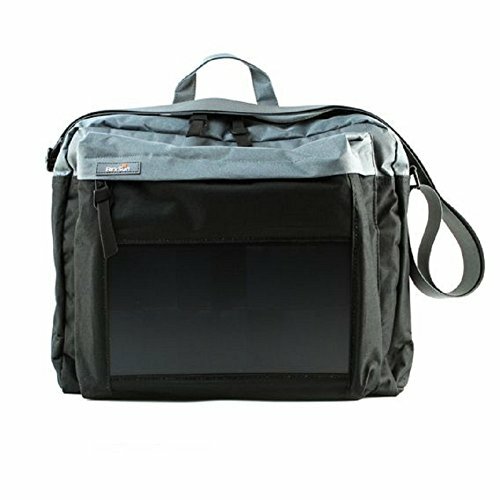 The BirkSun Connect solar charger is designed for both the hustler and the business professional. Free yourself from being tied to a wall outlet and use the power of the sun to charge your devices on the go. Simply plug a USB device (using the standard cables that came with your device, or you can buy extra BirkSun branded cables) into the patented USB connector sewn into the bag, and start charging. You can also super- power your Charger by combining with a BirkSun Power Bank (external batteries that have been optimized to take a solar charge; sold separately). Plug any BirkSun Power Bank into the Charger's connector to capture and store the power of the sun for later use. The Connect Pack includes a 15-inch fleece laptop sleeve, organizational front pocket, and neoprene organizer sleeve. Use the power of the sun to charge your USB devices, like smartphones, GoPro Cameras, wireless speakers, Bluetooth headphones / earbuds, water purifiers, electronic cigarettes, etc. If you have any questions about this product by BirkSun, contact us by completing and submitting the form below. If you are looking for a specif part number, please include it with your message.